I hope everyone is enjoying 2018 and everyone’s MINI Cooper is healthy and shiny. Winter does have it’s challenges with keeping a Cooper shiny. Recently I was contacted by the Richmond, Missouri Director of the Mushroom Festival. She inquired about the MINI Cooper’s participation in the 2018 Mushroom Festival. 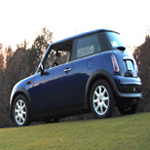 I would like to get some feedback from as many people as possible to determine if there would be enough interest in having a MINI Cooper Rally at the Mushroom Festival. We have had 5 events in Richmond, Missouri and before I commit to Mushroom Festival. I would like to hear from people regarding their support in 2018. Please reply with your thoughts and concerns or with any other comments. The date would be Saturday, May 5th, 2018 in Richmond, Missouri during the Mushroom Festival. BlueBerry 2003 Indi Blue MC, Black mirror caps & stripes, CVT. Aussie 2013 Pepper White MCS, black top/mirror caps, chrome hood scoop & interior trim, leather seats, Automatic. I am always up for the Mushroom Festival. I hope you get enough interest to make it happen. I love that you coordinate this event! Unfortunately, with it falling on Cinco de Mayo, I'll be working. ragtopday Johnna wrote: I love that you coordinate this event! Unfortunately, with it falling on Cinco de Mayo, I'll be working. I love this event too! I noticed the other day that it falls on Cinco de Mayo....It was awesome that you came last year! Lots of fun!